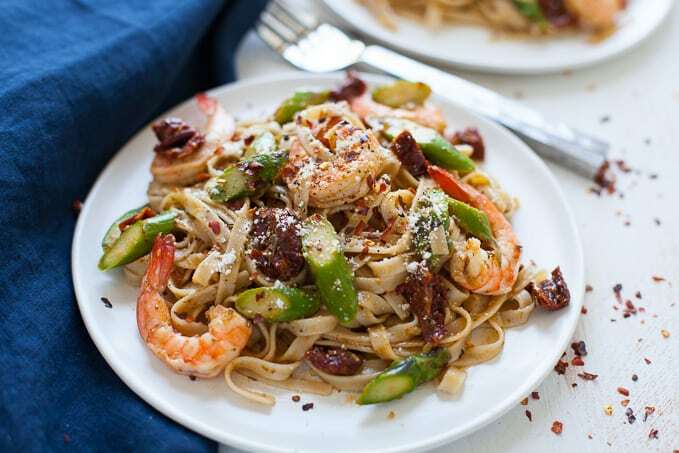 This easy shrimp pesto pasta with asparagus and sun-dried tomato is super easy to make for a quick weeknight dinner. Steve and I have been traveling up a storm lately and unfortunately the bulk of that travel has not been together (minus our trip to Buffalo to meet our adorable nephew, Collin Michael!). So our nights at home the last month have been few and far between. And with limited time together, I haven’t wanted to spend much time in the kitchen cooking up elaborate meals that would take away from us time. 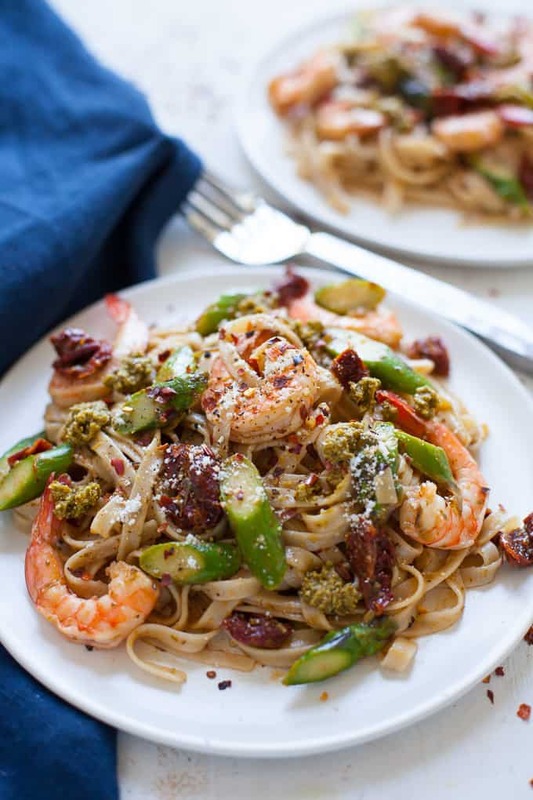 Enter this easy shrimp pesto pasta. Which should be renamed super easy shrimp pesto pasta. I wasn’t even planning to post this recipe on the blog but it was so easy and simple and delicious that I thought this has to be on the blog! Because I know I’m not the only one with a busy life out there. I know I’m not the only one who wants to limit their time spent in the kitchen to spend more time with their fam. I know I’m not the only one looking for quick weeknight meal solutions that are nourishing and delicious – this is one of them. I love customizing pasta dishes for the seasons. Adding butternut squash in the fall and winter. Adding eggplant or fresh tomatoes in the summer (like my caprese pasta salad). And adding asparagus in the spring! Plus, once the weather starts getting nicer, I start craving lighter pasta dishes made with pesto as opposed to rich, creamy sauces (which I totally dig in the wintertime). And pasta can be a nourishing, satisfying meal! I have some clients who fear pasta – that once they start eating it they won’t be able to stop. But ain’t nothing wrong with pasta people! 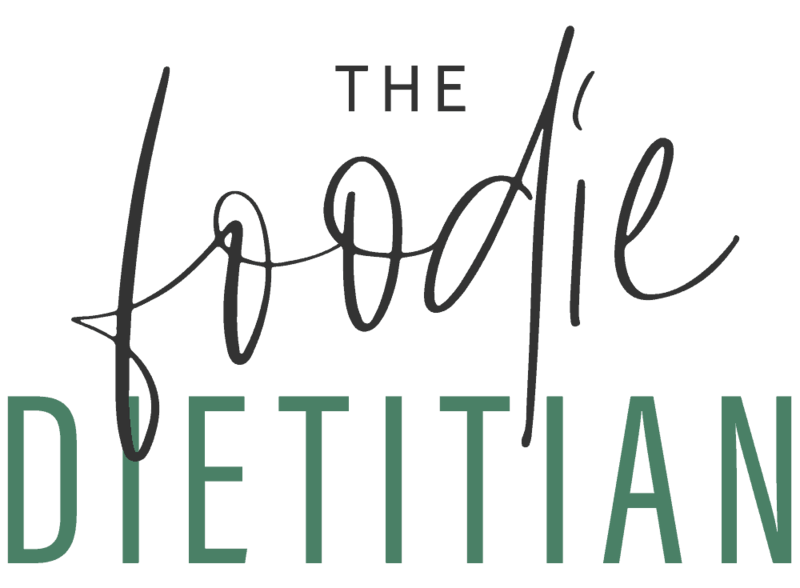 If you want to make it more satiating, add some protein, vegetables and opt for a whole-wheat pasta or brown rice pasta (for added fiber!). That’s what we did with this pasta dish – make it uber satiating and satisfying. 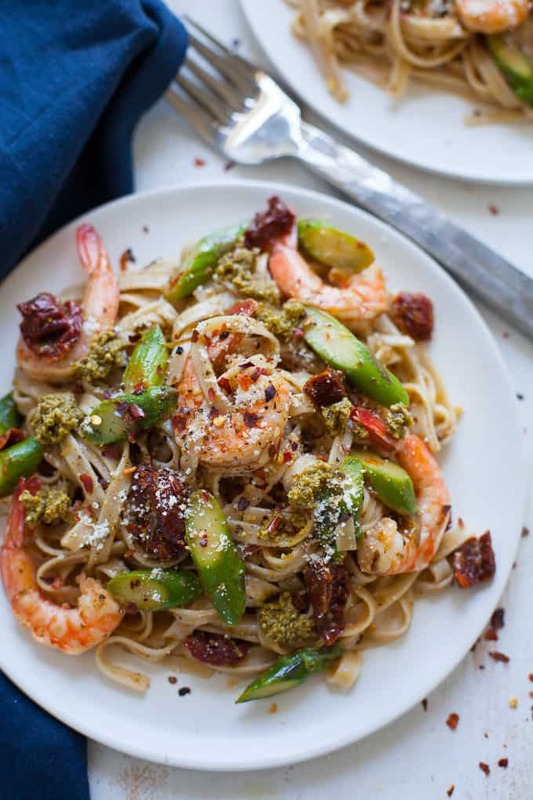 Because this is easy shrimp pesto pasta, I used store-bought jarred pesto but once summer hits and those farmer’s markets and CSAs are in full swing, feel free to make your own homemade pesto using fresh basil! I love making big batches of homemade pesto in the summer and then storing them in ice cube trays so that when I want pesto all I have to do is pop a cube out! If you’re looking for a homemade pesto recipe, try my arugula pesto or hemp pesto! 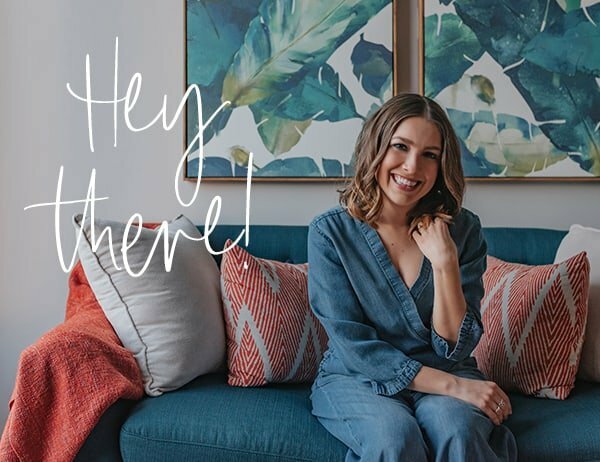 I hope this easy dish makes your weeknights a little less stressful and a little more enjoyable! In a large pot, bring salted water to a boil. Cook pasta according to package directions. Reserve 1/4 cup pasta water before draining. In a large nonstick pan, heat olive oil over medium heat. Add garlic, let cook for 30-60 seconds, or until fragrant. Add asparagus and sauté for 5-7 minutes or until just tender. 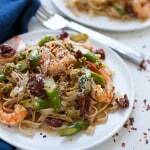 Add sun-dried tomatoes, shrimp and pesto. Turn heat down to low. Drain pasta and add pasta and reserved pasta water to pan and toss to coat. Remove from heat. Salt and pepper to taste. Add parmesan cheese and red pepper flakes, as desired. Tell me, what’s your favorite easy weeknight meal? Hunny you better come through!!! I needed this recipe in my life. I had everything in the house already and didn’t need to leave thank goodness. It’s snowing bad here in Chicago. This recipe is simple yet flavorful and great for meal prepping, which is really what I did. I doubled everything she’s was able to get five healthy servings from it. Thank you boo!! Awesome dishes and recipes are so amazing. I was looking for some vegan recipes from a long time but in your blog i found the very helpful results. 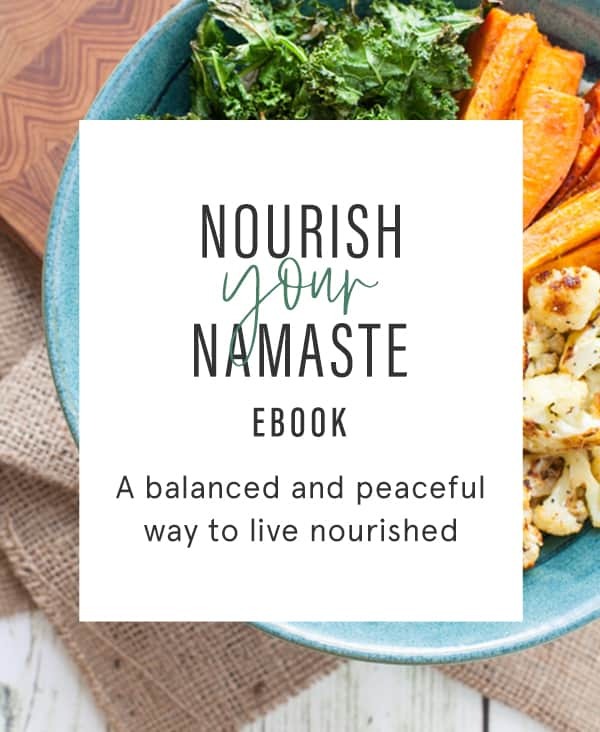 Thank you for sharing such a wonderful blog and please bring some more vegan dishes recipes. Oh gosh, this pasta is mouth watering! Such flavorful ingredients you have going on! Yum! This looks so good! Love quick, healthy, seasonal dinner ideas! Love how impressive this dish looks yet such a simple ingredient list! Looks delicious. Thanks so much Kelli! This dish is really so flavorful and nourishing–I just love it. 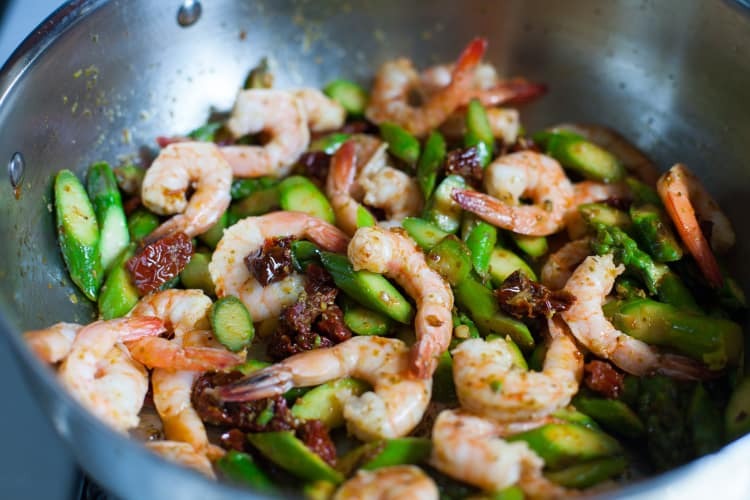 Love the sun dried tomato / asparagus combo! Pesto is my fav pasta sauce. Especially during the summer when I can grow basil outside and make my own at home! Homemade basil is what summer dreams are made of! This looks heavenly! 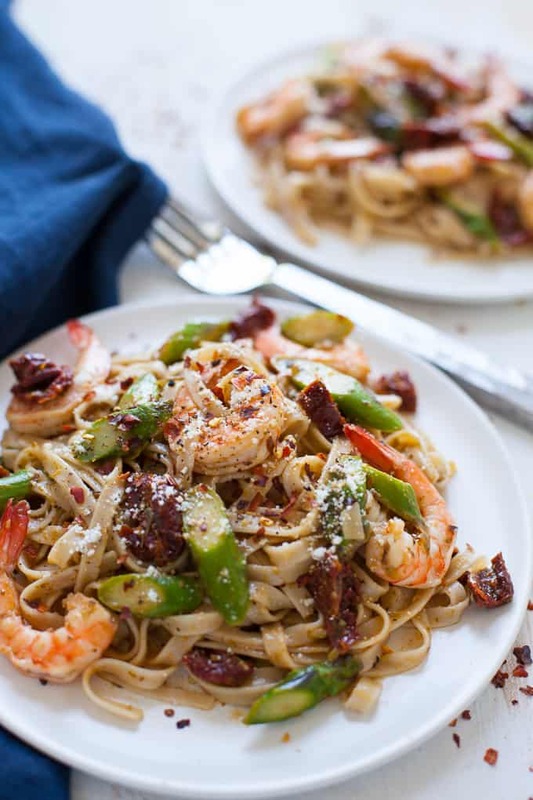 Pesto, shrimp, and sun-dried tomatoes are favorite ingredients of mine so this dish is right up my alley – and “easy” is even better! This dish looks absolutely stunning! And congrats on your new nephew! 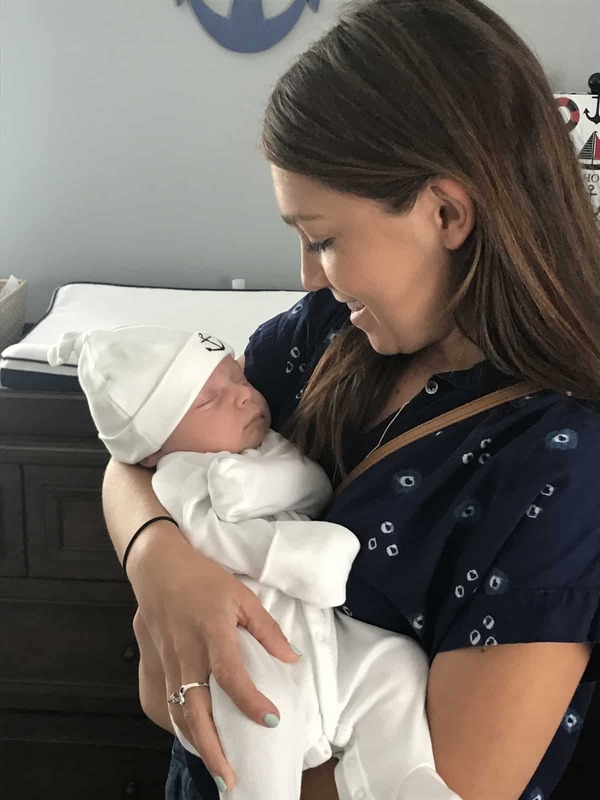 I just got to meet my new great nephew and new niece this month, being an aunt is awesome!